The Star Wars Cupcake Decorating "Kit"
This week my youngest son is celebrating his 6th Birthday. I won't be specific about which day, but with family in town this weekend, I made some pre-birthday cupcakes to serve as dessert. Last weekend we were at our local mall-like-shopping-location. It isn't really a mall, since it doesn't have that old-school enclosed building thing going on. It's of those open-air places, where you walk outside between the pretty-people stores. Each of the past 4 locations we've lived has had one nearby. Most of you who live in suburban America know what I'm talking about, right? We ventured into Williams-Sonoma -- the lure of free samples usually attracts my boys. The thought of one day having a kitchen like what's in their catalogs attracts me. There was a lovely display of Star Wars-themed kitchen supplies. Of course we were attracted to the display like white on rice! There in the middle among the cookie cutters and pancake molds were these "cupcake decorating kits". My kids begged "Please? Please? Please?" for one of the kits, so I caved in and let my youngest son choose the kit. I'm so glad he picked the Rebel Alliance kit instead of the Galactic Empire one. I thought the set was pretty cute, and at the time I didn't think anything of paying $12 + Northwest Florida tax for it. How could I turn down classic Star Wars??? Tonight my mom and I made some cupcakes for dessert, using 1/2 of the baking cups and toothpicks. That's what this kit is: baking cups and toothpicks. Probably about $1 worth of product, to be honest. We devoured the cupcakes and the used baking cups went right into the trash, but I made a point to insist that no one lick the toothpicks and make sure to recycle them. The pictures on the toothpicks are made of a slightly-waxed paper. Not quite cardstock, but a little heavier than just plain paper. My opinion? $12 for this kit is a considerable indulgence. My kids were smiling all evening from the cute toothpicks, and one could argue that doesn't make this all a waste. 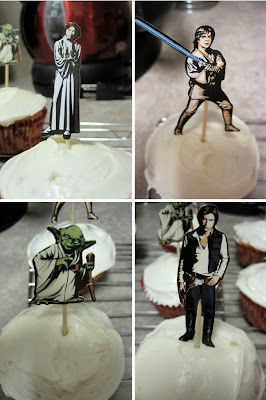 If you aren't picky about the baking cups -- considering R2, C3PO and Chewie were all on the bottom of the finished cupcake where no one will really see them -- you might be able to get away with making the toothpicks on your own. Consider how many different characters you could glue to toothpicks and stick in cupcakes! Maybe this is what I'll do for next weekend's Mario Brothers cake that's been requested for the party next weekend. Isn't Schoolhouse Rock the BEST???? I Googled images for "Hooray" and this scene from the episode on "Interjections" appeared. This point-to-point uploading is going much much faster than uploading to CrashPlan Central (i.e., "The Cloud"). Paul's machine to mine = 4.1 GB in about 12 hours, my machine to his = 1.7 GB in about 12 hours. If this is successful, then perhaps I'll pick up a 2 TB external HD at Best Buy and use this as my official backup plan. What we're doing right now is experimental, lots of band-aids in place to make this work, but I need a long term plan still. I called it. On Saturday I enrolled in CrashPlan for the 30-day free trial and so far I'm not that impressed. Their website claims "Free, Easy, Automatic Backup". So far, no. Paul kindly offered to sign up also -- we can always backup to each others' machines with the CrashPlan GUI without charge -- and we've spent the past 48 hours attempting to connect to each others' computers without success. Too many firewalls, port settings and over-my-head troubleshooting going on here. Paul and I exchanged no less than 30 e-mails last night bouncing different ideas to make this work. Most of the ideas were his...since he's the one who does IT stuff for a living and understands it more than I do. I guess using iChat or IM might have been easier to discuss this, but for some reason we didn't. Until we get the point-to-point backup working, I have a batch of files uploading to "CrashPlan Central" which is their offsite server system. This is what I'd have to pay a monthly fee for if I choose to go beyond the 30-day trial. Unfortunately, the backup to "the cloud" has been taking FOREVER. I have a 77 GB package I'm trying to upload (pictures, music, videos) and after 4 1/2 days, 7.9 GB has been uploaded. Go ahead, do the math. About 10.5% uploaded in 4.5 days = 47.25 days to upload this batch of data. And this is only from the MacBook! This doesn't include the PC's data (another 125 GB). I understand that once this initial upload completes, the worst of it will be over and we'll have our data in place. I'll see how this does through the weekend. If I see better progress, this might be worth keeping...but so far, I'm not quite impressed.